Isnt it adorable? I love that print! Bought it at hancock fabric and took whatever that was left from there. 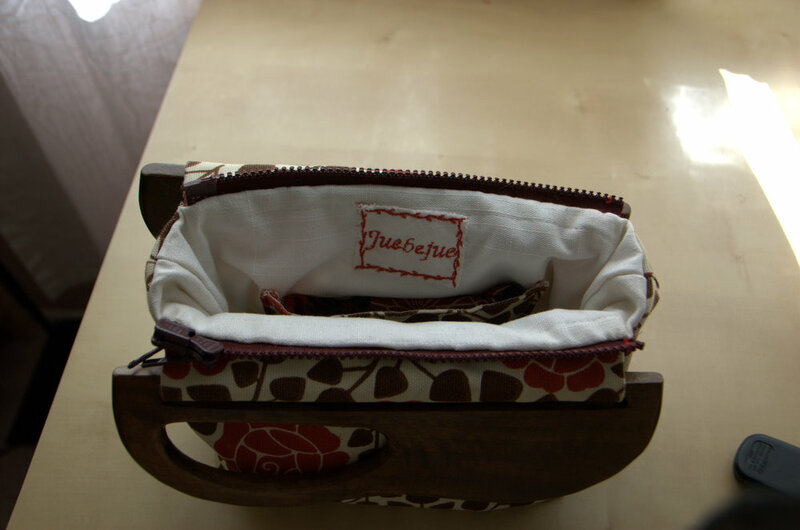 It is an outdoor fabric so it is very sturdy. I only used a little bit of it and the rest is going to be used to upholster a chair. Yes, thats right, that is a cute separating zippers — a pain to sew on, but less painful than the non-separating zippers. The lining is from left over linen curtain from ikea, very crisp and clean feeling fabric to offset the busy outershell. It had been interfaced with three layers of interface to add more body to offset the heavy handle. 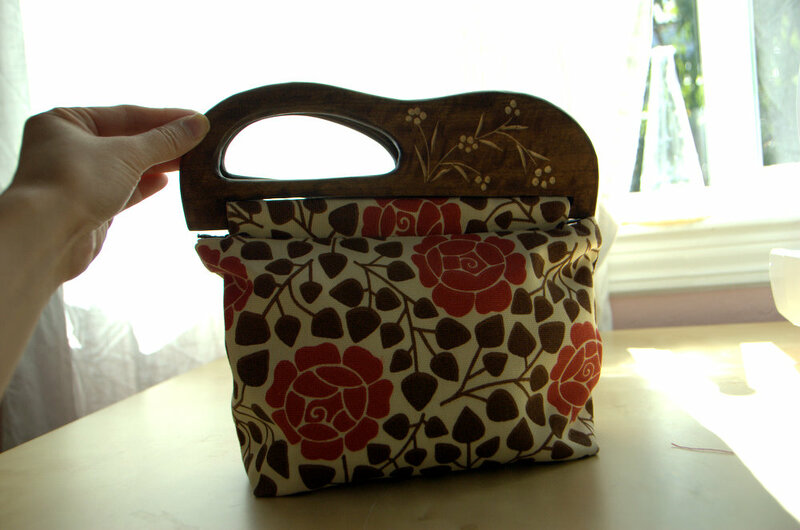 I had to handstitch the top parts of the bag together, due to the wooden handle, my machine wasnt very good around it. I am glad I did, I like how my bag doesnt show any stitches. Lastly, an embroidered tag! My husband bought me an embroidery machine a while back so that I can make cute tags for my stuff, I love it! ok, bag-fever is over for me, time to do more dresses! This entry was posted on Thursday, June 17th, 2010 at 8:36 pm	and posted in finished pieces, sewing. You can follow any responses to this entry through the RSS 2.0 feed. « Hawaiian Purse for Mom! 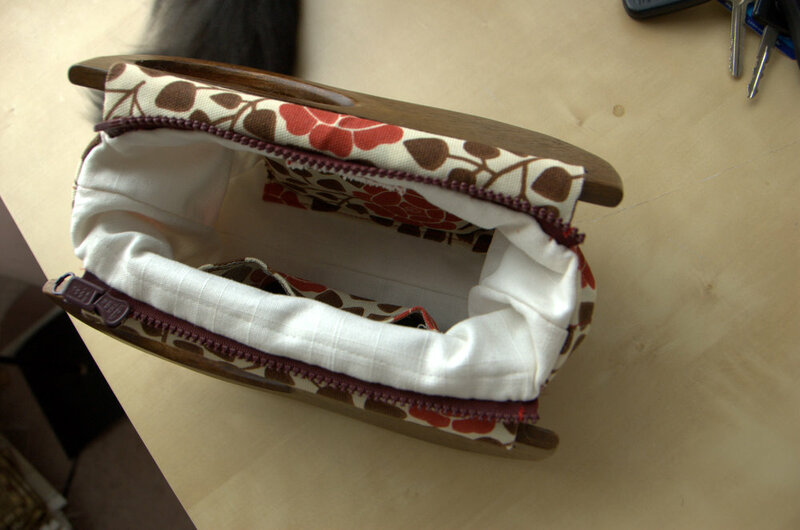 The fabric is pretty great….but the handles completely make it, IMO. Those are so fun! What a cute purse! Yay for the embroidery machine and your own tags! I want to see how you upholster a chair… is it difficult? Yay! I wanna make bags too. That juebejue tag is so cute. This is a truly unique bag. hi tracy! 😀 i should really tag my creations more! 🙂 i love them but i get too lazy.